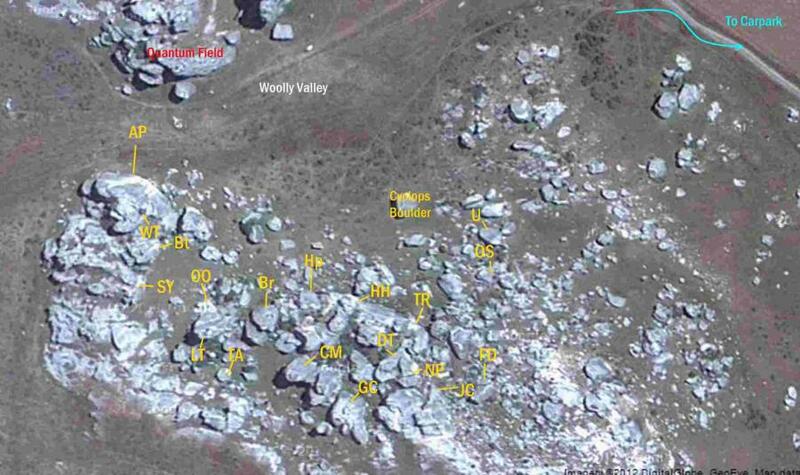 The area of boulders south to the south of Woolly Valley. Follow the main access track from the carpark. When you get close to the big limestone boulders, look left. This area is Spittle Hill. The Cyclops Boulder (a diamond-shaped boulder with a big pock in the centre), is a good place to orient yourself. Thin left-leaning crack on a white slab. Line of pockets. Faces the farm. Start as for Tales from the Riverbank. Move rightwards onto the wall, over the corner and onto the shelf. Prominent rib down and to the right of Tales from the Riverbank. The crack behind and above Tales from the Riverbank. Left of Only Dogs Eat Meat. To the left of Death Trap. A small round arete to the left of Manufactured. Traverse in from the left, past the bolt (and the crux) to the thread runner, before finishing past another bolt. A slab route on the right-hand side of a large free-standing boulder north-east of Only Dogs Eat Meat. Left of Frozen Dinners. Guess what? It's a slab. Hard start, then a nice slab to finish. Climb up steep pockets to the scoop, and then onto a slab finishing past a horizontal break. Trend rightwards after leaving the ledge. Turn subterranean grottoes into mushroom farms. Climb the pocketed arete. You'll notice a distinct cap and a small shrub at the top. On the opposite side of the TB boulder. Scamble to a ledge, then start climbing. Exciting step up at the 3rd bolt. Climb the steepening slab, with an exciting clip on the 1st bolt. Found opposite from WB. Bouldery start to finish on pocks. Uphill from YA. Start by rocking up on a small slab, and climbing a line of pockets finishing through a small overhang. Just down from TA. Slab route. Next boulder down from FT. Climb the wall with the big pock feature. 25m down from ToTR, to yellow/grey pocked wall. Follow the S shaped crack, exiting R-wards to top. Slab to the L of Hp. Start on L, traveres R-wards into groove, over the flake sharing the finish with Hump. Small arete. Gain the ledge, then step L-wards along the flake. On the yellow wall above Hump but below the roof. Move delicatley past the 2nd bolt, then L-wards to climb the crack to finish. Faces Woolly Valley. Start on big pockets then move R-wards up the slab, to set youself up for the final lunge at the top. Found on the back of the perfume bottle. Dyno up the north arete, then move L-wards upp the slab, the through the bulge and finishing up the groove. On the Craigiburn side of the perfume bottle. Start up the slabs on the Rh-side. Behind the perfume bottle. Smear on to the arete, cross the wall onto the groove. Start on Lh-side, climb through the bulge, finishing on a slab. Corner that features a groove. To the R of SRY. Climb through the middle of the large white wall. Behind AP, on the same boulder. Found at the head of Woolly Valley, ascends the obvious yellow wall. Grovel out of the groove and ascend the yellow wall, to finish below the roof.